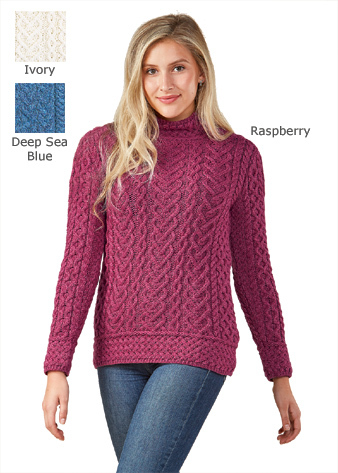 Knitted cables form a chain of hearts to sweeten this Irish-knit pullover. Hem, cuffs and high collar in contrasting basket stitch add a finishing touch. 100% super-soft merino wool; hand wash. XS-XL. In Raspberry, Ivory or Deep Sea Blue. Made in Ireland. I love this sweater and purchased it for my best friend who loves cable sweaters and hearts. I will write you with her expressions when she opens it Christmas Eve.